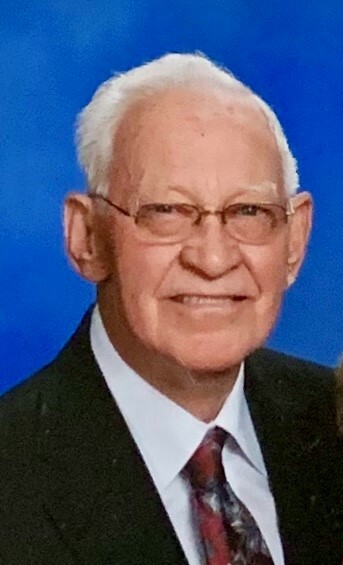 Joseph Maefiel James, 88, passed away on Thursday April 11, 2019 at his home in Charlestown, Indiana after a long illness. His wife Frieda and his children were at his side. He was born December 19, 1930 to the late Joseph and Mary Ellen James in Tell City, Indiana. He moved to Charlestown, Indiana in 1955 for employment at the Indiana Army Ammunition Plant. Maefiel retired from Ford Motor Company at age 57 after 30 years of employment. During his retirement years, Maefiel and Frieda would often vacation in Florida and travel the country in their RV. He was a life long member of St. Michael’s Catholic Church in Charlestown. Maefiel leaves his wife, Frieda Marie (Ernst) James of 69 years of marriage; his children, Steven James, Daniel (Donna) James, LaDon Schneider and Karen Roy; grandchildren, Dustin James, Andrew Schneider, Dakota (Colleen) Pawlicki and Megan (Ryan) McGaughey. He also leaves a brother, Marvin (Janice) James. He was proceeded in death by his children, Kathryn James and Ernest James. Visitation will take place on Sunday, April 14, 2019 from 12:00 to 7:00 pm at Grayson’s Funeral Home, Charlestown, Indiana. The rosary will be prayed at 6:00 pm at the funeral home. Mass of a Christian Burial will be held on Monday, April 15, 2019 at St Michael’s Catholic Church at 10:30 am with burial to follow in St. Michael’s Cemetery. The family request donations be made to Hosparus of Southern Indiana.